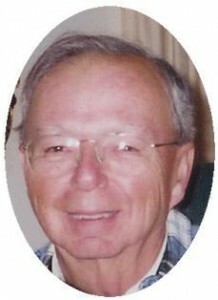 Ronald J. Molitor, 73 of Tower Drive, in Port Washington died Monday, May 26, 2008 at Vitas Hospice in Wauwatosa. He was born October 4, 1934 in Port Washington to John and Anna M. Wilmes Molitor, Jr. Raised in Port Washington he graduated from St. Mary’s School and Port Washington High School. He married Elsa Schnitzer of Port Washington at St. Mary’s Church on October 22, 1960. Together they lived on S. Madison Street for 39 years and recently moved to Tower Drive. Ron served in the US Army in Germany from 1954 to 1957. Upon returning from Germany he began working for the United States Postal Service as a letter carrier. He retired in 1989 after 33 years. He was a member of St. Mary’s Church, Port Washington, the National Association of Letter Carriers #1222 and the Fillmore Horseshoe club. In addition to playing horseshoes he enjoyed traveling, spending winters in Florida, playing shuffleboard and cribbage and solving crossword puzzles. He loved his wife, children and grandchildren. He is survived by his wife Elsa and children Mark Molitor of Port Washington, Thomas (Ann) Molitor of McFarland, WI and Karen Molitor of Port Washington. Further survived by grandchildren Jack, Claire and Nicholas Molitor, brother James “Jim” (Audrey) Molitor of Port Washington, brother-in-law Matt (Carol) Schnitzer of Riverdale, North Dakota, nieces, nephews, other relatives and friends. Preceded by an infant daughter Mary Ann Molitor. Funeral services will be Thursday, May 29, 2008 at 7PM from the funeral home to St. Mary’s Church, Port Washington for Mass of Christian Burial at 7:30 PM. The Reverend Tom Lijewski will be the celebrant. Interment will take place in the parish cemetery. Visitation will be from 4 – 7PM Thursday at the funeral home with a 4 PM Rosary. Memorials appreciated.